It should come as no surprise that architecture and interior design are complementary elements in high-end home design. But, more often than not, these services are parceled out into sequential agendas, adding unnecessary steps and potential lapses in communication. That’s why Jennifer Lombard, our newest hire, is the custom home design version of having our cake and eating it too. As a licensed interior designer with a graduate degree in architecture, Jennifer is skilled in all facets of the design process. From initial concept to final details, Jennifer is equipped to collaborate on, improve and expand our design services while enhancing client experience. bldg.collective is a high-touch, residential architecture firm with a penchant for attracting dynamic clients eager to explore bold and unique designs. In the (nearly) 10 years prior to finding Jennifer, we had worked with a slew of talented interior designers on numerous creative and successful projects. But even in best-case scenarios, clients found themselves, essentially, dating two people while relaying information between. With Jennifer on board, clients benefit from a single point of contact—bldg.collective—with whom to explore preferences, lifestyle, parameters and ideas. 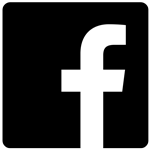 This allows us to develop conceptual ideas much faster, without any unnecessary back and forth. Jennifer practiced interior design for nearly a decade before studying architecture, and comes to the table with new perspectives on both where and how to initiate the design process. Her multifaceted approach, when paired with our always-collaborative process, serves to streamline communication—both with client and vendors—as we can develop the interior design alongside and in relationship to all other elements. It’s always desirable to have the exterior and the interior of the home feel like they’re part of the same conversation. Because of Jennifer’s broad proficiencies and role at bldg.collective, she knows each project inside and out, and is adept at integrating a cohesive design vision throughout interior and exterior spaces. Sometimes this translates to like textures, colors and lines. Other times, the connection is more abstract. Either way, as Jennifer delves into interior details, she does so with a comprehensive knowledge of the project vision, structure and timeline, and an intimate knowledge of client goals. Perhaps the most obvious benefit of integrated architecture and interior design services lies in project management. 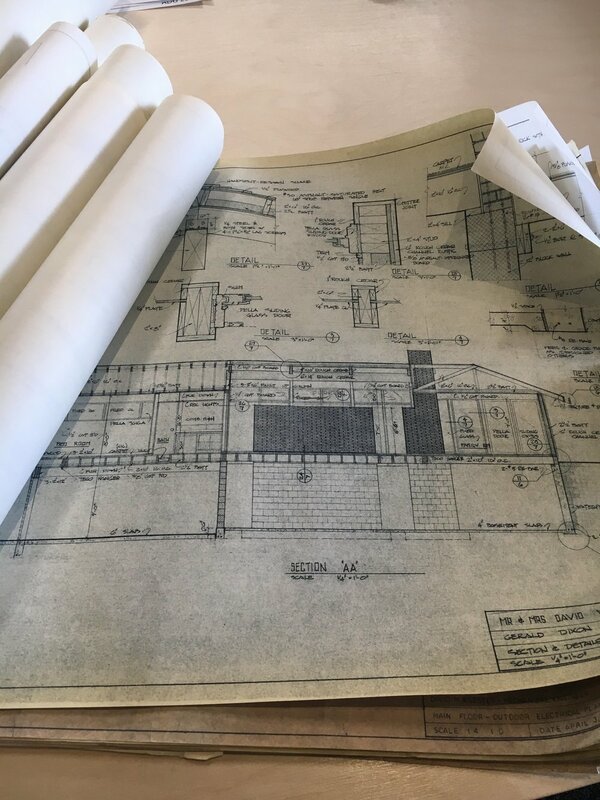 To design and build a custom home requires countless layers of details and decisions, all of which need to be effectively communicated to the right people, at the right time. By folding interior design into our process, we’ve eliminated any struggles in coordinating with a third party and minimized the risk of lapses in communication. As a result, the client experience is faster, cleaner, and less involved. The time that is saved in minimizing dejavu design conversations almost always translates to money saved. We offer a wide spectrum of interior design services—from interior design consulting to full-home interior design. We then oversee the execution of every detail. 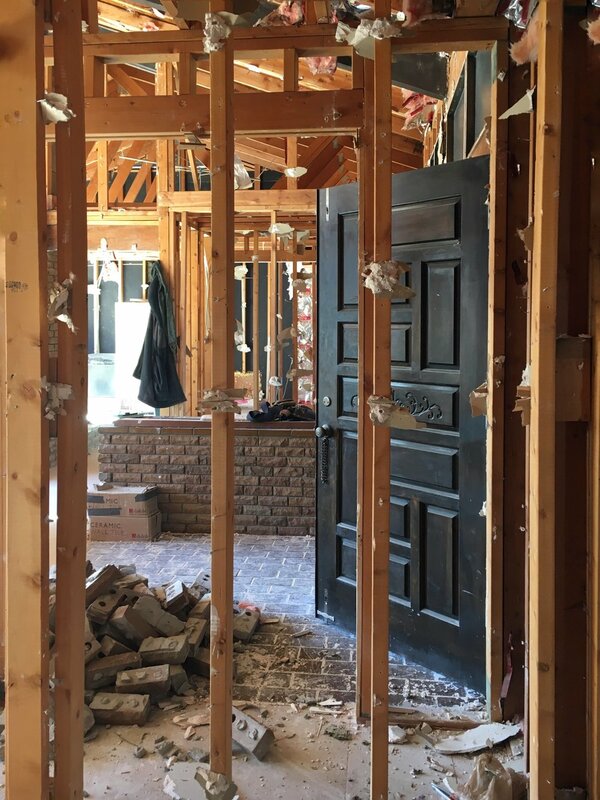 And, because interior and exterior construction are orchestrated solely by bldg.collective, we can be more nimble and effective in scheduling contractors, meaning fewer mistakes. All of this results in lower costs and more successful projects. 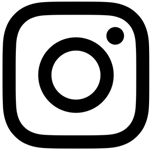 To learn more about our interior/exterior architectural design services, click here. In reality, it’s not so simple. 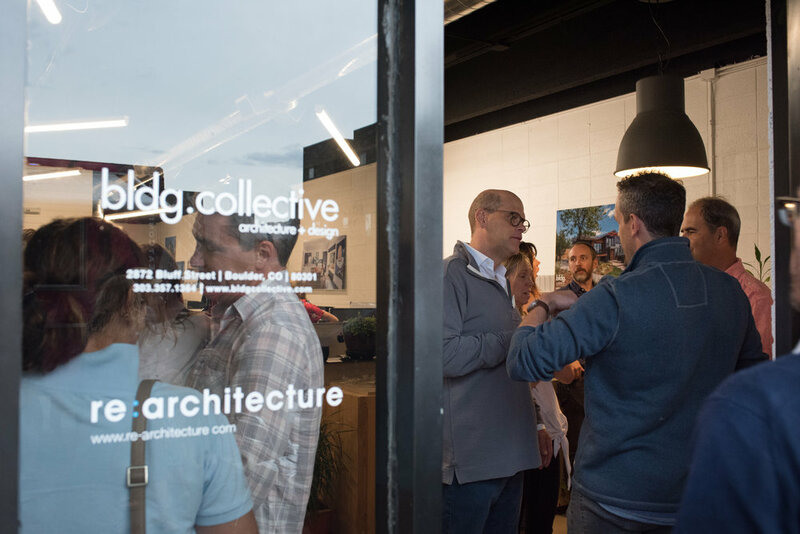 At bldg.collective, our day-to-day involves juggling multiple projects in different phases, consistent communication with homeowners and project teams, hours of creative thinking and problem solving, and diligent planning. We’re chameleons in a sense, taking on many forms outside the realm of ‘all-knowing’ designer/architect—we are inspirational speakers, therapists, translators, marriage counselors and accountants. It’s a crazy, complex, yet extremely rewarding profession. To give you a better idea of what goes on behind the curtain, we boiled it down to the average day (although truth be told, there are no ‘average days’ at bldg.collective). 7:30 - 8am: Arrive at the office. We live close enough that biking to work is an option when the weather cooperates, otherwise, it’s a quick drive. Grab a cup of tea or coffee, choose the music selection for the morning, and get settled. We recently purchased a Japanese hot water dispenser for the office for making tea (the small electric kettle wasn’t cutting it). Not only does it keep four liters hot and ready, it sings a little song when it finishes heating the water to your desired temperature. Precision is a key ingredient...in architecture and beverages. 8 - 9am: Emails, texts and calls begin to pour in from contractors, construction teams, vendors and homeowners. There’s no such thing as “easing in” to the work day, but it energizes our mornings and keeps us on our toes. Contractors like to start their day early. Collaboration is at the root of what we do, so we have to stay flexible and consistent with communication and keep the airwaves open at all times. 9 - 10:30am: Head to a weekly residential site visit, typically called an OAC (owner, architect, contractor). These meetings are a type of “progress report” that happen during the construction phase of a project, and allow us to have a hands-on approach from groundbreaking to final execution. We walk through the home and answer questions, discuss architectural details, finalize the heating and cooling system coordination, look at stain samples for wood finishes, assess plumbing fixture layouts—you name it. Snap a photo or two for our social media feed before heading back to the office. 11am - 12:30pm: Back at the office to meet with a potential client. During these initial meetings, we strive to gather an in-depth understanding of the client’s life. We ask a series of questions about their lifestyle, family, style preferences, budget and timeline. Often the jumping-off point for a design lies within how a client talks about something rather than the words themselves. This is where the “translator” aspect of the job description comes into play. We analyze a client’s emotion and tone to help understand how they might be thinking or feeling about the project as a whole or a particular aspect of it. This helps us create a distinctive, meaningful space that reflects their vision and accommodates the way they live. Lots of critical listening is the important part of this work. 12:30 - 1pm: Our drafting tables conveniently double as ping-pong set ups. Quick match to blow off some steam. 1 - 2pm: Walk to our neighborhood Whole Foods to grab lunch. On a Friday, we might treat ourselves to a nice coin style marg and baja fish tacos at Verde up the street. Only one marg, of course. We’ve got more work to do. 2 - 3pm: Despite our jam-packed schedules, making time for community involvement is important to us. 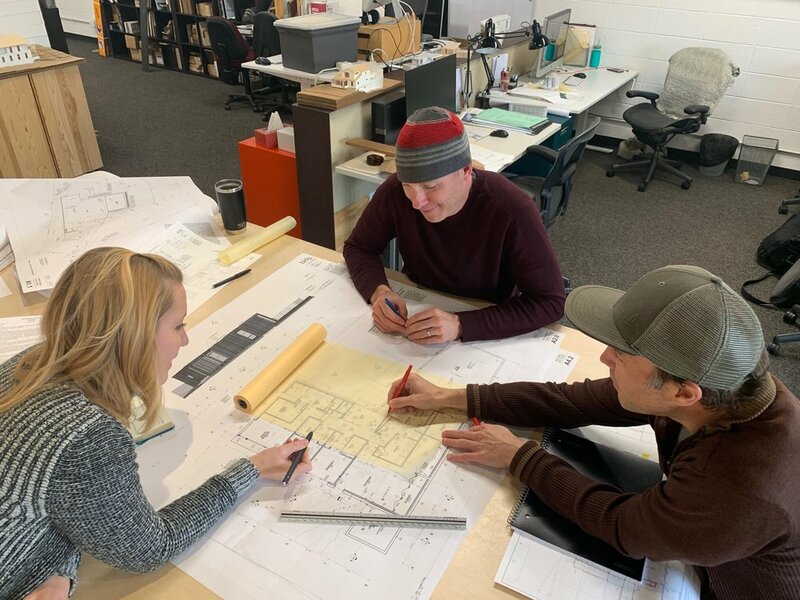 Some afternoons, Steven will sit in on classes at the CU College of Architecture and Planning and review student projects or Jennifer will mentor high school students in a program developed to get kids interested in our industry. 3 - 4pm: At the office, we head back to our desks to focus on any projects in the design phase. This is probably what comes to mind when you think of an architect—although chances are the reality isn’t as romantic as you may have imagined. We’re not creating masterpieces out of charcoal by candlelight. Typically, our masterpieces are created by the warm glow of the iMac screen. 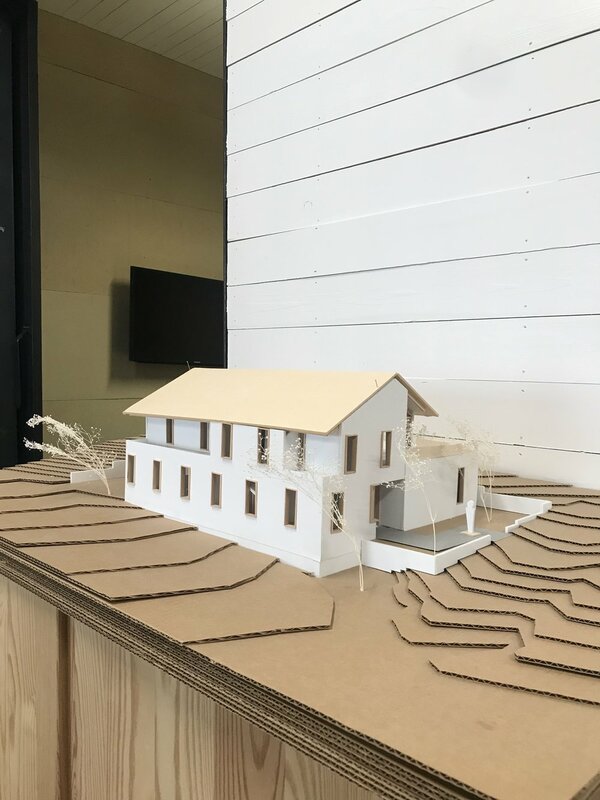 We take the information gathered in a series of client meetings to create rough sketches, drawings, computer renderings and models of the potential home. It’s where our loves for artistic innovation and mathematical precision find balance. 4 - 5pm: Meet with the team to discuss plans for an upcoming commercial project. 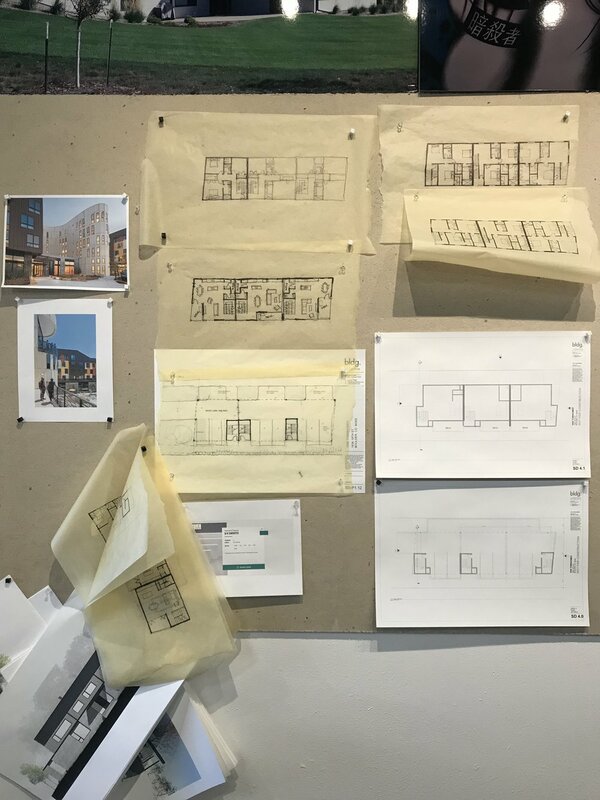 We walk through space planning, layout and interior architectural elements while Jennifer, our in-house interior designer, presents her plans for paint colors, finishes, lighting, furnishings and the materials palette. We gather around our large work table and white board and review the drawings pinned up on our presentation boards. 5 - 6pm: Begin to wrap up by responding to any emails, calls or texts received throughout the day. We often wonder how anything got accomplished before the dawn of Gmail and the iPhone. Time to hit the gym, the tennis court, or meet a colleague for happy hour. 6pm: Some evenings, we open up our studio to the community by hosting a movie night, open house or educational workshop. But typically, we pack up our things and head home for a night spent with family, friends and dogs. Want to know more about what it’s like to work with us? Click here. Why did you choose to live in Colorado? Chances are it had something to do with the year-round blue skies, mountain views, access to nature, and the state’s legendary laid-back lifestyle. As architects, we look at the Colorado lifestyle through the lens of a building and its inhabitants, with the goal of creating homes that intertwine Colorado’s calling cards into every facet of daily life—from peering out your window while cooking dinner to enjoying the sunset from your living room sofa. 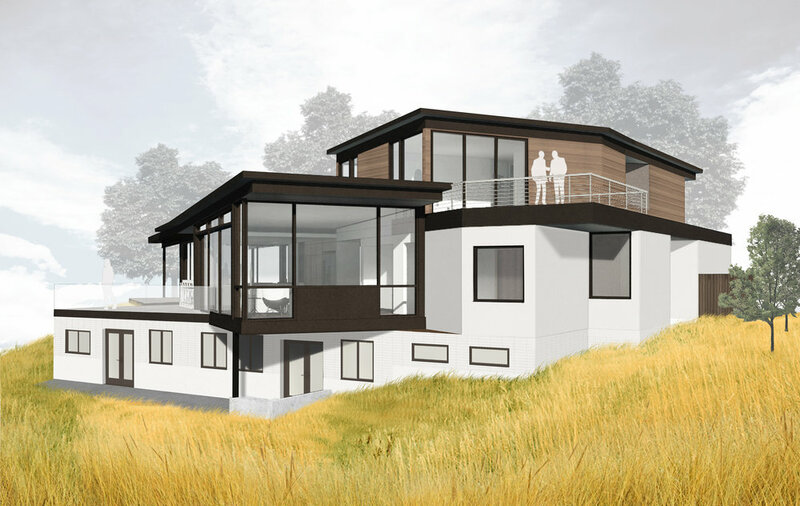 No two properties are exactly the same, resulting in custom homes designed to communicate and interact with their unique surroundings. What is Site-Responsive Design & Why Does it Matter? What is the terrain and topography like? Which views are paramount on the property? Are there any busy roads or neighboring homes nearby? What types of plants and wildlife are indigenous to the area? The answers are essential to creating a space that is not only responsive to its site, but informed by its unique surroundings. In result, each design is completely original and find-tuned to its particular location. Instead of choosing a perfectly flat space to build, we embraced the site’s ridgeline and designed the home to step down the sloping site. This gave the home a striking form that appears interdependent with the terrain, and created an opportunity for two levels of outdoor living spaces. Interacting with the ridgeline also gave the contemporary structure a sense of permanence, appearing as if it’s been present on the site for many years. 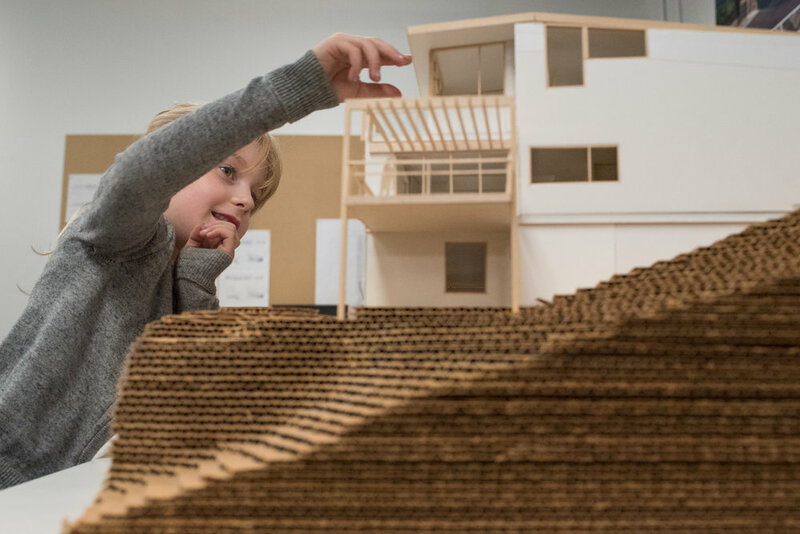 To capture sights of Longs Peak and the Flatirons, we designed the layout as an elongated, cantilevered structure that positions the main living spaces toward panoramic views. Colorado’s abundance of sunlight is celebrated throughout this home with the help of 10-foot floor-to-ceiling windows on the east and west sides. 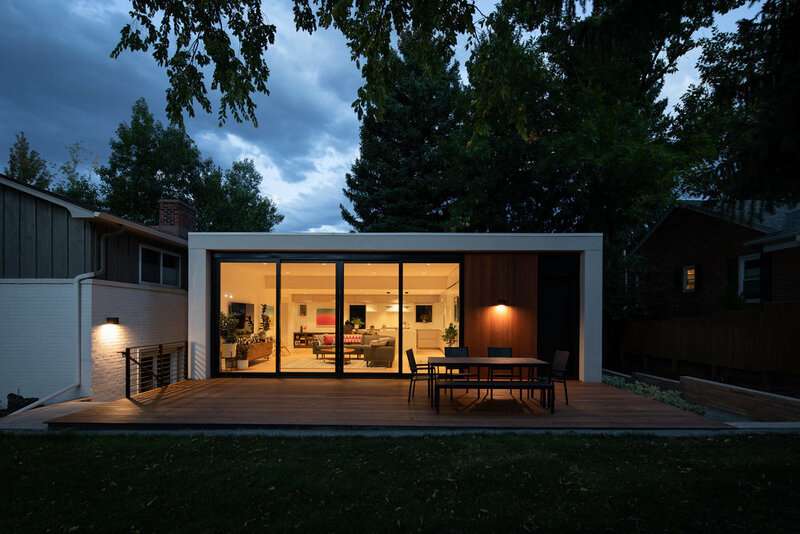 The home is positioned on the west side of a grove of cottonwoods to create a barrier between the main road and the home’s entry, adding a heightened sense of security and privacy. Looking to build a custom home in Colorado? Contact us today for an original design that celebrates its surroundings. At bldg.collective, sustainable architecture isn’t a trend, it’s fundamental to good design and core to our beliefs. But what does ‘sustainable’ mean to us? Is it using reclaimed or recycled materials? Cutting energy usage? Sourcing materials and contractors locally? All of the above? There isn’t a textbook formula for designing and crafting a sustainable home. We’re lucky to be based in a city that’s leading-edge in sustainable design, and enforces strict codes that require new buildings and renovated homes to be as energy-efficient as possible. (Boulder County has even proposed a goal to make all new residential construction Net Zero by 2022, meaning each new build would produce as much energy as it uses.) So our baseline residence is already extremely efficient and eco-conscious. Since we live among such picturesque landscapes, we have a lot of clients who want floor-to-ceiling windows to to maximize views and natural light. Opting for a high-performance brand such as Alpen helps reduce heat loss in the winter and heat gain in the summer. One of the better-known energy-saving options, this technology converts sunlight into electricity used to light and heat a home. Products such as Tesla’s Powerwall are providing battery storage solutions for energy produced on site but is needed at a future time. But this energy producing technology is no longer confined to the form of solar panels that attach to a roof anymore—recent advancements include incorporating photovoltaic technology into concrete, glass and shingles. Although these technologies are not currently available in the mass market, we are excited about the possibilities that these products will provide in the near future. This in-ground system essentially uses the consistent, internal temperature of the earth to heat and cool a home. These systems are a lot more expensive than an average furnace or boiler, but the payoffs are powerful. There are varying degrees of insulation options. For those who want to go above and beyond, we can implement exterior insulation—an extra layer of rigid foam that lives beneath the siding materials, creating an airtight seal that wraps the whole home and greatly reduces thermal conductivity through the wood studs in a typical framed wall assembly. A home’s energy output is a constant balancing act during the building process—as a design changes and shifts, so does its energy efficiency. We’re one of the few firms with an in-house certified RESNET Home Energy Rater—a title earned by our founding principal Chris Gray that means he can measure energy performance throughout every phase of the design. Armed with these cutting-edge tools and years of experience and knowledge, we have created highly energy-efficient homes. When it comes to renovating existing homes—such as the Utica Residence, an extensive remodel with exterior installation, high-performance windows and rainscreens to lock out moisture—we typically improve the energy efficiency by 300-400 percent. We also recently completed a new build for a net zero home on 63rd Street, with solar energy capabilities and geothermal heating and cooling. Thinking about going green? Contact us to see what options fit your family’s needs.